Landowners, particularly farmers and ranchers, have unique opportunities to be environmental stewards of the land and minimize the impacts of pesticides. This section describes buffers used to reduce drift and wind erosion potential. For a complete description of the full benefits of buffers, including installation and maintenance see the links to resources at the bottom of the page. 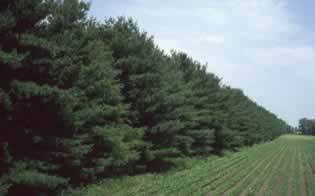 Also referred to as windbreaks or shelterbelts, wind buffers consist of single or multiple rows of trees primarily intended to protect crops from high and damaging winds. 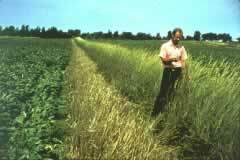 Wind buffers reduce pesticide drift by lowering wind speed within treated areas and by physically intercepting drift. Wind breaks can also reduce runoff if they are planted densely and perpendicular to the slope. Areas of herbaceous vegetation, resistant to wind erosion, and grown in strips perpendicular to the prevailing wind direction. These strips trap wind-borne sediment and nutrients and pesticides carried by sediment. Tall grasses, up to 5 feet, and other non-woody plants established in narrow strips spaced across the field perpendicular to the normal wind direction. These barriers reduce wind speed and wind erosion and intercept wind-borne soil.